Bangladesh is drenched in water bodies and is globally famed as the river country primarily because it lies along the Bay of Bengal and is poised over the Ganges Delta – the confluence of three rivers that flow into the bay. The country is adorned with more than 700 rivers and its tributaries which combine with the floodplains to form the delta. Bangladesh houses world’s largest water discharges produced by the three rivers: Brahmaputra, the Ganges and Meghna. All of the rivers, tributaries and rivulets that flow through the country join the Bay of Bengal. Being largely fringed with water in and around makes Bangladesh extensively fertile and prosperous which provides multiple fishing opportunities for anglers. The fertility of the soil and fresh water makes agriculture and fishing the major resources of living here. The prosperous rivers and their tributaries inhabit innumerable fish species. Over 200 tropical species of freshwater fish and over 60 species of commercial fish are the inhabitant of this nation’s water bodies. 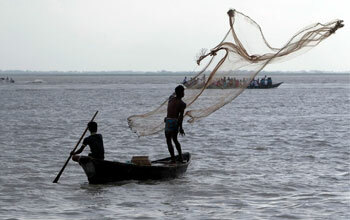 The commercial fish are largely found in the Bay of Bengal. The prime fish species that dominates the water in and around Bangladesh is Hilsa shad. It is the Bengali fish which accounts about 1/3 of the total fish species in Bangladesh. This species is extremely overfished in all the rivers, rivulets and bay. Fishing in Bangladesh is fairly simple and cultural. Angling here reflects the cultural aspect of Bangladesh which includes the river life of the rural Bengali population. Angling here would be utterly different from the fancy and updated angling in other countries. However, the modern facilities are provided for the travelers but it is preferable to indulge in the rural techniques of fishing. It is quite interesting and intriguing to use nets, traps and spears while fishing instead of rod and reel. If you have the skill or learn quickly you can have a chance of catching fish with bare hands. 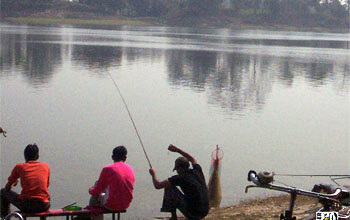 Dhaka National Zoo Lakes are the hot-favorite fishing spot for anglers. The zoo comprises two elegant lakes which are replete with special fish species like rohu, catla, mrigal, kalibaus, catfish etc. The names given to these lakes are based on the directions they are in: northern and southern lake. The northern lake is fairly bigger than the southern one. Bangshi is another favored fishing spot. It is one of the most important rivers of this country too as apart from fishing it affirms to be a major region for life and productivity. The river was once a flourishing region but now because of the population it has become lifeless. However, during the monsoon the fresh water emerges and makes it full of life by washing away the polluted water. This is the time when various fish species gather here to lay eggs. From the start of monsoon till February one can witness numerous fish species here. One can indulge in angling during this time of the year.